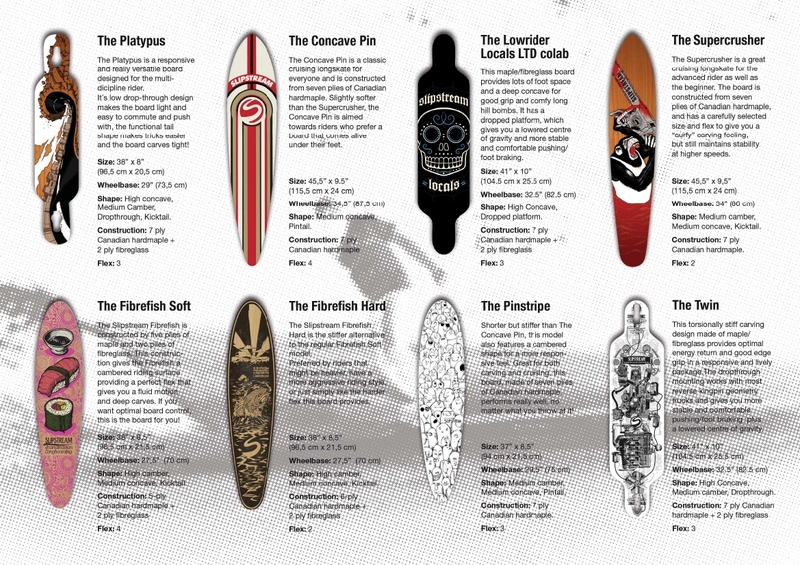 The Platypus is a responsive and really versatile board designed for the multi-dicipline rider. It´s low drop-through design makes the board light and easy to commute and push with, the functional tail shape makes tricks easier and the board carves tight! Shape: High concave, Medium Camber, Dropthrough, Kicktail. I have Randall 180 trucks and i am wondering if it will fit on this board and be good. The Randal 180:s work perfect with this board! IS there a kick on the ends of this board? I am currently looking for a “trick board” and thought this one might suit my needs. Kick in the tail, not in the nose! Good “trickboard” in our opinion! I’m just wondering why you decided to have a kick in the tail ( you can ofc switch and use it as a kick in the nose) when you do most of the tricks with longboard on the nose? Why is there only one tail and not two? – Mathias: In our opinion, this is our most “Fun” shape. Good for tricks and a tight carver. Highly recommended if you like to go out and shred some! – Oscar: A kick tail/nose is good for some tricks, a “flat” tail/nose is better for other tricks. As you are suggesting, this board can be ridden just as easily backwards as forwards since it is a true twin (if you disregard the tail/nose shape). Hope these answers are enough, ask away otherwise! Hey! I have a set of Randall 2 150 trucks. How do they work with this board? Will there be anny problems while carving/sliding etc? The Randal 150:s are a solid choice for this board. Carving and sliding work well, and you will not have to worry about footbite! The trucks that you mention ride really similar. The biggest noticeable difference (in our opinion) when ridden is the bushings, and if you do not like the stock bushings they have, you could always replace them with bushings you like better. i have just bought a platypus. it’s nice but it didn’t turn so good as I hope. should it not turn very good? Which trucks do you use? Most of the turning capabilities lie in the trucks, or to be accurate, in the bushings of the trucks. A change of bushings can make a huge difference! If the bushings are hard, like in many setups recommended for beginners, the board does not turn as easily as when softer bushings are used. The riders weight is also a factor to consider. Get back to us if you need any further assistance! Hello, I’ve planned to buy a platupus. But What’s the maximal Weight and how soft is it? Go visit your local dealer and see if you like the way this board flexes, but it has a “medium” flex when compared to other boards in our lineup. I have one question about this board. How much will it bend when i jump and land on the middle? Will it breake or just flex back? I am going to do tricks and sliding so my question is if this board is a board for me? That depends on how much you weigh and how high you jump, which both is important to know if we are supposed to calculate how much this board will bend. Our best bet would be that you visit your local dealer and find out for yourself! The board does not break when jumped on, it just flexes back. In our opinion this is a good trick board and you can slide with it, but the performance when sliding depends a lot of the kind of wheels chosen. I really like the shape, and I just wanna ask ya how much it weighs? And will 75mm O’tang In Heats get the wheelbite or not? This board weighs 1.43 kgs and the wheels you mention together with 180 trucks will not result in wheelbite. Beginners who are into carving and cruising are probably a little better off with “The Twin” than “The Platypus”. Hi im looking to buy either the The Platypus or the twin. what du you think if I need a allround board so I can go fast, cruise and carve?? For going fast, cruising and carving we would recommend “The Twin” over “The Platypus”. We just found a video with “The Platypus” ridden on Youtube – watch it here! what kind of trucks and wheels will i get if i buy a complete platypus? Erik – That depends on where you buy the board! Different retailers provide different truck brands, and often let you choose for yourself, so please consult with your local dealer! ok i think i will go for the twin then! thanks! hello again if i choose the twin should i have 70mm or 75 mm wheels???? Try before you buy to see which size you like best! i would like to know what this board has that is better than “The twin”. This board is narrower, shorter and has a shorter wheelbase compared to the Twin. It also features a bigger nose and tail and a kicktail. These differences give you a board that is lighter, quicker and easier to do tricks with. Hey. Hvor store trucks skal jeg sætte på dette brædt? We can recommend both “150:s” and “180:s” on this board depending on your preferences. like shuvits. What board should I get then? This board sounds like a good choice for you. I own a platypus and currently bought the randal rII trucks 150 mm. My question is, do you recommend using risers (obviously giving the opposite effect of “rising” the board) or would this make the board “to low”? What are the pros and cons of using risers with this setup? HI, i just bought this board, and the rest of the set. But i cant figgure out how the trucks shall fit? can u please explain or link a movieclip or something? Johannes! – We recommend using rubber shockpads between the truck and the top of the deck to decrease the appearance of cosmetic stress fractures on the deck. In our opinion there is no such thing as “too low” (as long as you don’t get railbite). Lundis! – Your local dealer should be able to assist you in the assembly of your board. All dealers are required to offer this service to their customers. If you are uncertain or a beginner – Do not purchase a board that is not assembled! The hanger width on the Holeys is actually 174 mm, and we agree that using BigZigs and Holeys on The Platypus might cause wheelbite. Sorry for not being able to help you out here, but if you really want to use this combo, your best bet would be shaving off about 3 mm on each side of the board. Will Randal 180mm and Retro Freerides 72mm get wheelbites on this board? Albin, that combo should work out just fine! 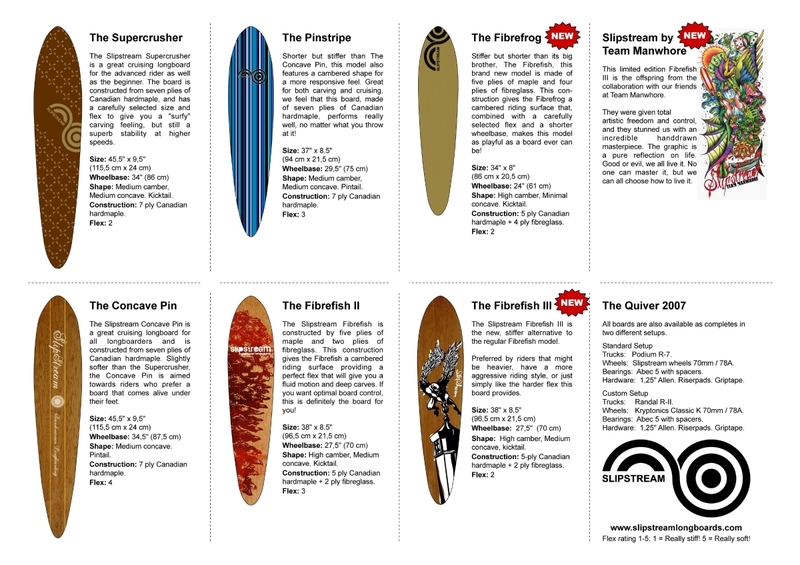 All our shorter boards (Platypus, Pinstripe and Fibrefish) are great boards to cruise/surf around the town. If you do not want to have a kicktail the Pinstripe should do the trick, but this is really a matter of preference. Try it before you buy it if possible! 70mm “Speedballs”? But otherwise I LOVE it! Please notify the dealer you have purchased the board from that you must have gotten the wrong size trucks. All “180” trucks work like a charm on this board together with the 70 mm wheels, so some kind of mix-up has happened here. Hello Im thinkin of buyin this board, Im a total newbeginner and am reading and trying to figure out if this might be something for me. 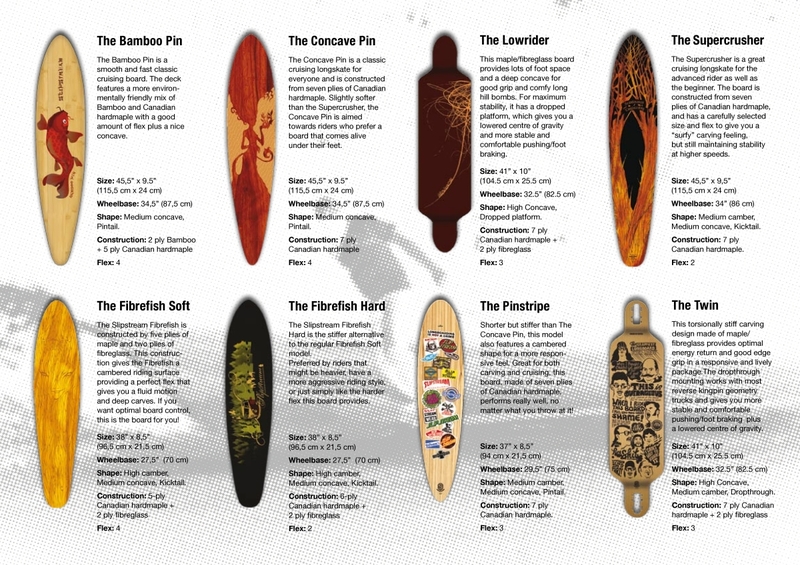 I was thinking of buying from http://www.hollywood.se/sv/product/6093/the-platypus-riders-setups-longboard#filter-2 here. The board is complete whit Hjul: Retro BigZigz 75mm Truckar: Holey 180mm.. I was reading here and saw that I might get wheelbite from that combination, thats strange that they sell it like that then? Anyway Im kinda small so thats why this particular board caught my eye and also since the drop through boards seem more stable and easier to manuver, I hope Im right. You are correct that we believe that wheelbite is most likely to occur with that setup. Perhaps the shop knows better, but you should try it before you buy it with those components. To be on the safe side: Go for the setup with Paris 180:s and 70 mm ZigZags. I have a platypus with 180 holey trucks but the store changed the 75 mm bigzigz for the 70 mm zigzagz. and that works great! The wife got me this board and was a true timewarp. Wow, after twentyfive years of inhibation my feets was once again free. It might not be the ultimte board, but Im sure damn is the ultimate _re-entry board_. And with some griptape on the nose and tail it sure rocks. For me, a board without a kicktail is not a proper board. Thx to the guys at Hollywood I am back in the game. tja ska köpa min första bräda till nästa sommar vilken rekomenderar ni jag vill ha en allround bräda som går att göra allt med? kommer denna bräda att passa eller passar the twin bättre? This board is good all round with a slight lean towards tricks. Pretty narrow for speed in our opinion. The Twin is bigger and heavier and thus not as suitable for certain tricks, but better for speed. As Always: Try it before you buy it if possible! Hi, just wonder if the Randal 180 trucks are good for sliding? The Randal 180:s are a solid choice for this board. Good slidingtruck as well. Is this board good if you are gonna do mannuals and nose mannuals? And is it good for sliding? This board is well suited for technical slides as well as manuals (the kick nose/tail makes them a lot easier). Tjena, jag har eran bräda the fibre fish soft 2010 och den är grym, men jag funderar på att köpa en lite “trickigare” bräda, vilken rekomenderar ni? In our lineup, many riders prefer “The Platypus” for a more technical “trick friendly” ride. Hej , jag funderar på att köpa en Platypus2010 . Är jag för kort för denna bräda om jag är 1,32m lång? This board will definitely work for you, no worries! Hi i wonder if randal 150 mm with 70 mm wheels will work on this board? In our opinion you should go for a wider “180” truck on The Platypus to avoid wheelbite on all common wheel shapes and sizes. how would it be if i top mount it with randal 150 and 70 mm wheels? That should give you less chance of wheelbite, but riding this board “Dropmounted” is more fun in our opinion! Jag funderar på att köpa en Slipstream Platypus 2011 version, är det 2 kicktails på brädan eller bara 1? Är det en bra bräda för att göra tricks som shuvits och manuals? Jag har en Slipstream the twin och det har lossnat trä bitar (nosen) av den ganska nyligen efter jag köpte den för runt ett år sedan.. Är det något man kan förvänta sig av platypus brädan också, ärligt svar tack. The 2011 Platypus has kicktails in both ends, with slightly different angles to make the board even more versatile. Regarding boards splintering/cracking in nose/tail – this is normally caused by the board hitting a hard object (wall, curb, pavement, etc. ), and could happen to pretty much any board if you are unfortunate. The good news though is that these damages usually are purely cosmetical and will not affect the performance of your ride. I wonder if this board is fine to use like a transportaion board, just cruising around with in the town and so on? I´m not searching for a board to do tricks and stuff with, just to cruise around with in the summer, is this a good choise then? This board works well for transportation/cruising, but is perhaps geared more towards riders that are into tricks as well. Should do fine for you, but as always try it before you buy it if you feel uncertain. I have been watching some youtube videos when the platypus is used for cruising and it seems to work very smooth and fine. But my question is if it will be shaky in higher speeds, because the 38” leght ? And what is the hardness on the wheels (orginal)? it only says 70mm. Ted, the length will probably not be a problem as the wheelbase is relatively long, but this board is perhaps not as wide as you would like in higher speeds. Different dealers provide different setups, so you should probably check with your dealer regarding the durometer. Hello, i have look at this longboard and is very intrested to buy it. i just want to know witch is the best Wheels/Trucks for this longboard if you go alround boarding? Wider wheels or thiner wheels? We recommend wide, reversed kingpin trucks (Paris 180:s, Randal 180:s, Holey, to name a few). Wheels are really a matter of preference, but we recommend wider (above 50 mm) wheels around 70mm, durometer around 78-81 for good all-round performance. Ska framtrucken vara längre en den där bak? We recommend using the same width trucks (wide) on both front and back. Ok, men när jag köpte den kompletta brädan (hos Hollywood)så var truckarna i olika storlekar. Det verkade lite konstigt så jag tänkte fråga här. Philemon, please contact your dealer, that must have been an error from their side. Jag har lagt märke till att man kan välja ett par Podium truckar till denna bräda, Och har dessutom hört att podium är en billigare motsvarighet mot Randal:s truckar? Så, nu undrar jag , är det verkligen skittruckar ? The Podium trucks are OK, lots of truck for the money in our opinion. The most important thing is probably that you like the bushings they are equipped with, and that is a very individual thing. Try it before you buy it if possible! The Platypus without a “front tail” is last years Platypus. This year we added the “front tail”. So hurry up and buy it at MaxEffect if you want the one without “front tail”! is this board good for some slides. i like to cruise and pull a couple slides once i a while. is it good for sliding? You should probably go for the 2011 version instead of this one. The wider body and double kicks makes more technical slides even easier! Great board for sliding, carving and cruising as well. Hi Simon, Youtube is your friend!